An alternative to cow’s milk that tastes like melted vanilla bean ice cream. My daughter is lactose intolerant. As a child, the only available alternatives to cow’s milk were soy or milk that had 100% of the lactose removed. In the last few years, many different types of “milk” alternatives have come to the marketplace. You can find hemp milk, coconut milk, almond milk and others. For an informative nutrional comparison of the many milk products available, check out this article in Eating Well. 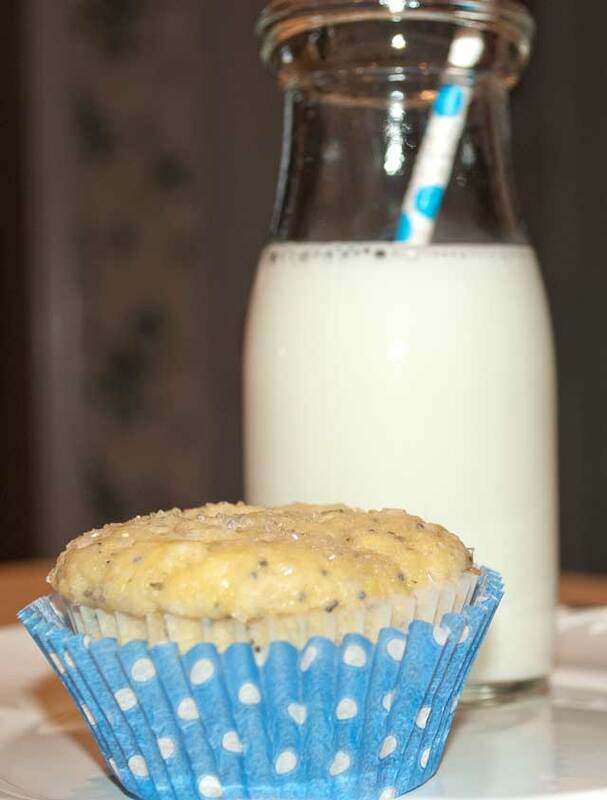 Recently, I stumbled upon a recipe for almond milk made at home. It is so delicious. I prefer it to store bought because I can control what is added to it. 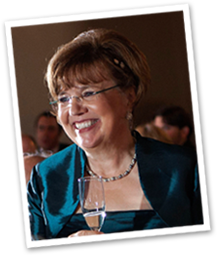 The almond milk that I make at home is a combination of several recipes that I researched, plus my own special touch. To begin, purchase raw almonds. These are available at most stores that carry organic ingredients or at food co-ops. I prefer organic ingredients, whenever possible, and I have ordered organic almonds on line. They do have a more pungent almond flavor. You must soak the almonds overnight to soften them. This makes them easier to pulverize in a blender. Don’t be too concerned about the time that you soak the almonds. If you get busy, they can soak more than overnight. One recipe that I found said that you could boil the almonds for 3 minutes. I have tried this and it is a faster alternative to soaking. The amount of almonds needed to produce one quart of almond milk can be varied. Most of the recipes that I found used 1 cup of soaked raw almonds to 4 cups of water. If you desire a richer thicker end product, play with the ratio of almonds to water. I tried 2 cups of raw almonds to 4 cups of water; and the end result was much more flavorful and the milk was thicker (less watery). 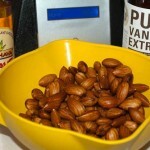 For this blog, I soaked 1 ½ cups of almonds in water overnight. 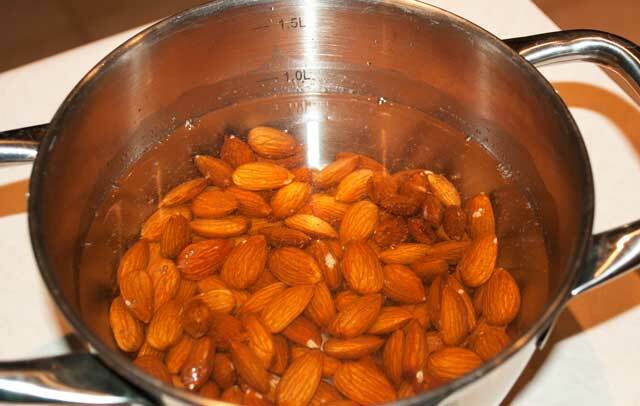 The next day, place 4 cups of water and your soaked almonds into a blender. Add 1 1/2 tablespoons of agave nectar, if you desire sweetened almond milk, 1 teaspoon of vanilla extract and a pinch of salt. Blend on high, until the nuts are pulverized, and the mixture is creamy white. Now, strain the mixture. I like using a nut milk bag. You can also pour the mixture into a fine sieve, placed over a bowl, and press the nut solids, with a spoon, to extract as much milk as possible. 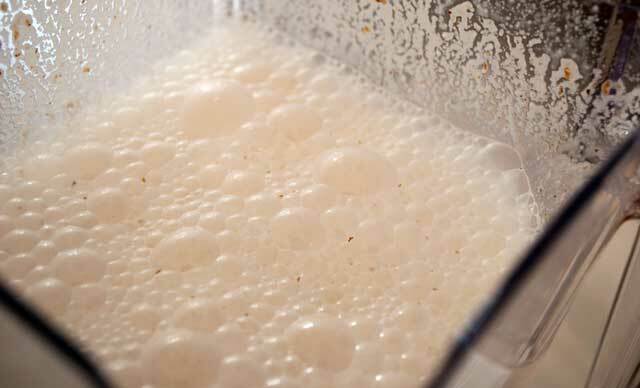 When the “milk” liquid is extracted, add ½ – 1 teaspoon of vanilla bean paste. You could also add the scraped beans from vanilla pods. This really heightens the vanilla flavor. 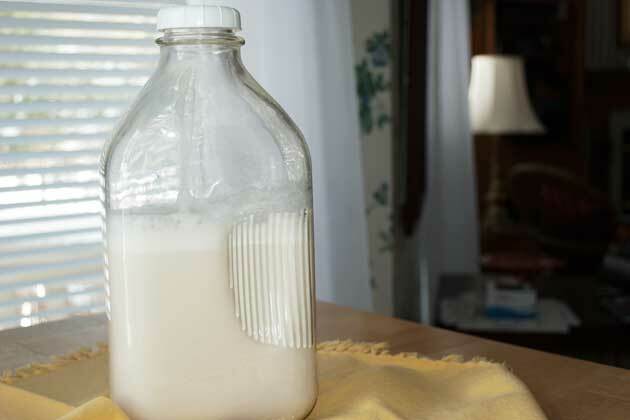 Pour into a milk bottle container and store in the refrigerator. The milk keeps up to 2 weeks. NOTE: The almond solids will sink to the bottom of your container so be sure to shake the milk before pouring. Pour a glass and savor with your favorite treat. NOTE: Don’t discard the nut solids. I spread them onto a cookie sheet pan and toast in a 350 degree oven for 15 to 20 minutes. Sprinkle them on your cereal, on yogurt or mix into granola for an extremely healthy additive. Soak 1 ½ cups of raw almonds in water overnight. 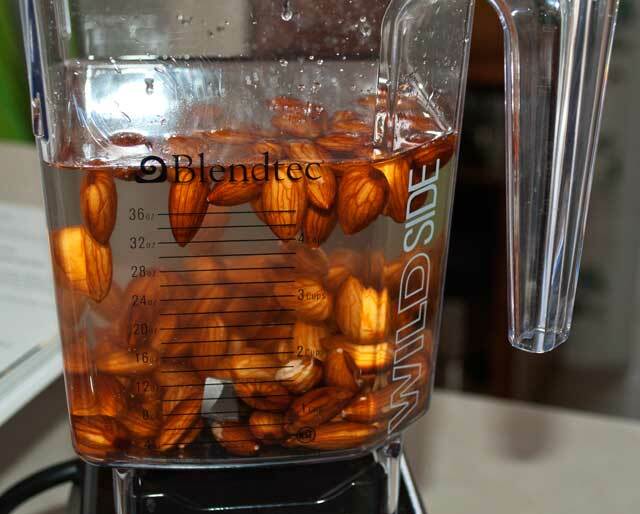 Place 4 cups of water and your soaked almonds into a blender. Add 1 1/2 tablespoons of agave nectar, if you desire sweetened almond milk, 1 teaspoon of vanilla extract and salt. Blend on high, until the nuts are pulverized, and the mixture is creamy white. Strain the mixture. 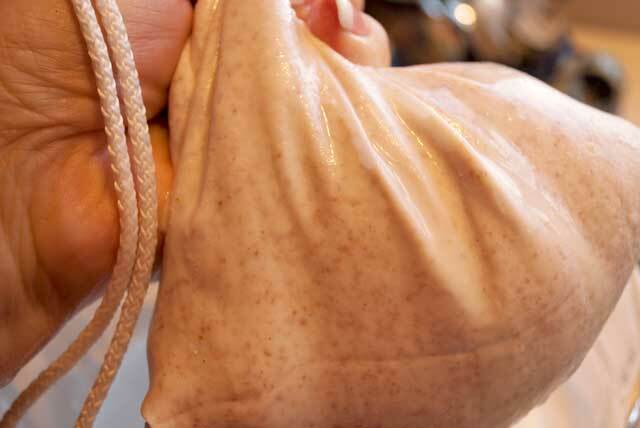 I like using a nut milk bag. You can also pour the mixture into a fine sieve, placed over a bowl, and press the nut solids, with a spoon, to extract as much milk as possible. 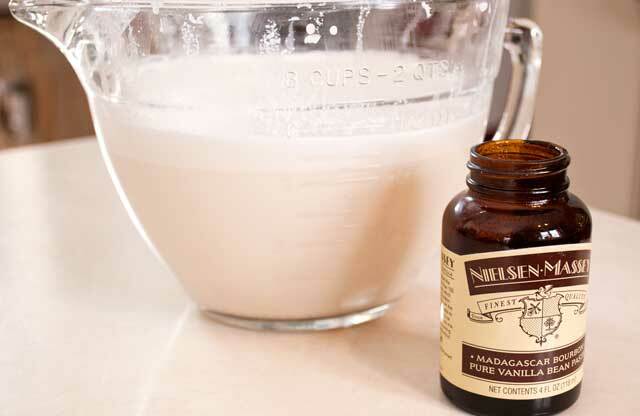 When the “milk” liquid is extracted, add ½ - 1 teaspoon of vanilla bean paste. You could also add the scraped beans from vanilla pods. This really heightens the vanilla flavor.